All of the ramekins I have seen from Lane have had paper stickers attached to the base. These have an incised signature " B Smith" and the number 78, most likely the year of manufacture, nor are there any cracks, chips or crazing. 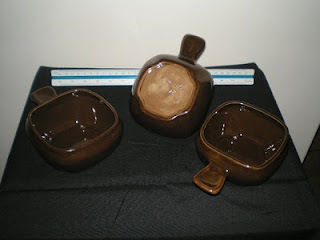 They have a modernist retro shape inspired by the European potters who had moved into post-war Melbourne and a deep reddish brown high gloss glaze. They measure 4.5" wide x 5.75" long. It is likely that Smith either worked at LK&W or took over the pattern after LK&W ceased production. Any information would be appreciated. Lane, Kemp, Willis Potteries Pty Ltd were established at 109 Highbury Road Burwood Victoria in 1936 and produced a variety of pottery until the late 1960s. They also had premises at 329 Warrigal Road Burwood. The ramekins they produced appear to have been of one pattern. Some had a black exterior and harlequin interior. The external glaze on these is a high gloss, covering the entire ramekin. Originally, the LK&W ramekins had an unglazed foot. They are square with rounded corners and the handles seem to resemble those of Cotton (UK).